The true mark of a masterpiece is always the artist's signature at the bottom of the canvas. The origin of the Signature Flute is no different. Made as a special gift for a Boston doctor who saved Mr. Powell's eyesight, the original "Signature Flute" was a Sterling Silver flute made in 1952, #1142. This gift was the doctor's first opportunity to play a handmade Powell flute. Today the Signature model is also the first opportunity for many to own a handmade Powell flute. 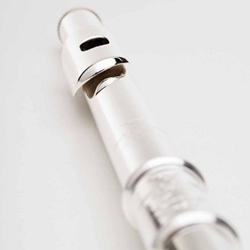 The most affordable handmade flute that we offer, this flute has a Sterling Silver headjoint, body, and mechanism. Signature Flutes have a traditional pinned mechanism which gives them a lighter weight. The tone holes are drawn using our patented method of extrusion, and each flute bears the signature of Verne Q. Powell. The final mark of quality on this instrument is the handcut Signature II style headjoint, made and tested by the same headjoint makers who work on our Custom Headjoints.